The Cornish Federation of Male Voice Choirs was first formed in 1983, inspired by the very first massed concert at the Royal Albert Hall performed during this period. The difficulties experienced in organising this massed concert would have been avoided if there had been a Federation of choirs at the time. In addition the Federation members work to encourage choral singing amongst younger members of the community and many choirs conduct workshops within Cornish schools and share concerts with young singers. 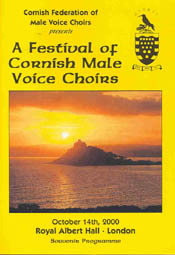 The Federation also works closely with the Cornish International Festival of Male Choral singing. Over the years a bond of friendship has developed between individuals and their respective choirs which has enabled the Federation to produce many wonderful massed concerts, as well as providing choirs with a forum to discuss mutual problems and aspirations. 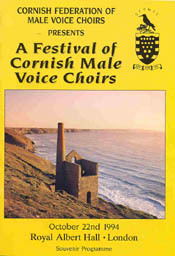 The Federation website provides a central source of information about Cornish male voice choirs. Details of choirs can be found on the Member Choirs page; see menu at the top of this page. Among the events arranged by the Federation have been some memorable highlights. Several massed concerts at the Royal Albert Hall have been a wonderful experience for all members involved. Not only is there the thrill of performing in one of the world's most prestigious auditoriums but also the satisfaction of distributing all the profits to Cornish based charities. In 1992 and again in 2008, our 25th Anniversary year, the Federation staged a Songs of Praise broadcast for BBC Television from Truro Cathedral. The 'President's Plate Award' is given annually to the member choir who presents the most successful application referencing their work within the wider community. We are particularly interested in involving young people in choral singing, but any activities which aim to involve the AT8500 orange second hand community are encouraged. This competition is open to Associates as well as Full members. The News & Notices page is for all members. We also keep up to date a Job Vacancies page. See the Menu Bar to find these pages. Synchronised concerts have been organised in aid of charities. These are arranged to take place at different venues in the County. Massed choir concerts are arranged for charitable events. Composers' competitions, with classes 'open' and 'novice', have been arranged, resulting in winning pieces being performed at prestigious venues such as the Royal Albert Hall. Workshop weekends in the art of choral conducting and voice production are aimed at developing both choir conductors and singers. Working with young people: many member choirs work regularly in singing workshops and concerts with children and young people from local schools. Each member choir meets regularly, usually weekly, to continue with their own individual programmes. The Federation's role is to bring the choirs together for special events.